While at first sight the area around Taipei Main Station may seem modern and of little historical interest, if you take a closer look at the facades you will discover surprising remnants of the urban landscape of Japanese colonial Taipei. A few days ago I was walking from North Gate along Yanping Road, one of the most historic parts of the city. The appearance of the street seems to conceal its significance. 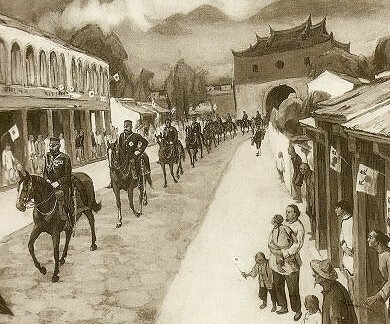 After the Guomindang's retreat to Taiwan, Taipei became the provisional capital of the Republic of China. As the economy of the island and the population of Taipei grew fast, new buildings inevitably sprang up everywhere, and the old ones were often sacrificed. However, sandwiched between new grey constructions one still finds houses and shops from the Japanese era. One of them is Taipei Futai Street Mansion. Taipei Futai Street Mansion is one of the last remaining examples of commercial and European-style colonial Japanese architecture (see Li Yiyang [edit. ]: Taibeishi: Guji Jianjie. Taipei 1998 [original date: 中華民國87], p. 53). It is located in Yanping Road, an historically important street that leads from North Gate to Zhongshan Hall. This street, formerly called North Gate Street, was located in the government district of Qing Dynasty Taipei. It was here that the Japanese first entered the city, marching from North Gate into the centre of power of the Qing (see my posts about Qing Dynasty Taipei and Taipei City Walls). Futai Street Mansion was built in 1910 by the Japanese businessman Takaishi Chuzo (高石忠慥; 1850-1922) to serve as the headquarters of his construction company Takaishi Gumi (高石組). Chuzo came to Taiwan in 1895, when the Japanese established their colonial rule on the island, and in the early 1900s he became one of the protagonists of the Taiwan construction boom. In fact, his firm built National Taiwan Museum in 228 Peace Park and the Sun Moon Lake [note 1, 2, 3]. After 1945, the building was taken over by the state and was first administered by the Ministry of Defence and used to lodge government personnel. In 1997, it was finally declared an historical site, but in 2000 a fire damaged it heavily. In 2006-2007 it was renovated (note) and turned into a small museum, curated by lawyer Chen Guoci (陳國慈). Let me now share with you a few pictures of other buildings around Futai Street Mansion. A building from the Japanese period. It is in a state of decay and, as you can see, there is an ugly extension on the rooftop. Another Japanese building with a rooftop house on top. Is it legal or illegal? I don't think anyone cares over here. I am not sure if these are Japanese buildings. Funny. There are so many this kind of building around Taipei, but I never have a good look at it, not to mention its history. I thought London was bad with having modern buildings sandwiching historical ones without a care about the overall impression of the city. But Taiwan takes the biscuit. Last time I was in Taichung I tried to take notes of all the historical buildings and almost all of them were dilapidated. One was a beautiful looking Qing era family house with courtyards but you could barely see the facade as it was so covered in ivy and weeds. My wife's father's family house was another of these Qing houses with courtyards but when the oldest son inherited it he knocked it down and built a modern building on the land. It's sad and the reasoning only half makes sense to me: first that these houses are uncomfortable due to dampness and circulation (not to mention only being one floor up) and second that those houses are haunted so no one wants to live in them. I do think the situation for conservation and restoration of old buildings is improving but so many old buildings have been lost that there are real gaps in the historical fabric of Taiwan's cities so that the cities are really unattractive places to go around. The focus is much more on the decoration of the interior of houses rather than the exterior.